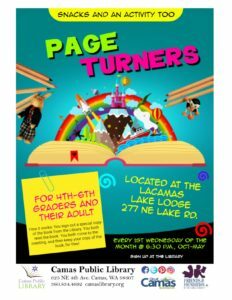 Lacamas Lake Lodge, 277 NE Lake Rd. How it works: Sign out a special copy of the book from the Library. Both read the book. Come to the meeting together and then keep your copy of the book for free. For children in fourth through sixth grade and their parent or guardian. Every first Wednesday; snacks and an activity provided.